In one simple video, from Slate. and a lovely green Nepenthes too. A complex and detailed question? I would say there is still hope for the Sarracenia. The problem is there is too much water. These are bog plants, which generally means they prefer very moist soils, but not where the water line is above the soil like you would do for a pond plant. And in a terrarium where the water is not moving, the water needs to be able to go down. I recommend carefully tipping the terrarium over to get all the water out, holding the plant in place as best you can. When you water, add enough to let the water sit at the bottom just high enough to get above the charcoal and into the soil, and then let the water go down below the soil/charcoal line before adding more water. Hopefully there will be new growth within a couple weeks. Thanks to Anne we are having a lot of success this year with our carnivorous plants! Here we have 3 plants and some of Anne’s great new basic care and prop info to go with it. Enjoy! Dionaea muscipula “Dente” is the small-toothed Venus Fly Trap of lore. Will eat rats and pigeons when it has grown big enough. Which should be any minute now. Dionea (Venus Fly Trap): Grow using the tray method year round. Hardy outside year round in the Bay Area and can take full sun once hardened off. Sarracenia purpurea is a lower growing Pitcher Plant from the swamps of the Allegheny Mountains. I wonder if that’s true? No, sadly it’s not. There are no swamps once you get high enough up in the Alleghenys. Good to know. 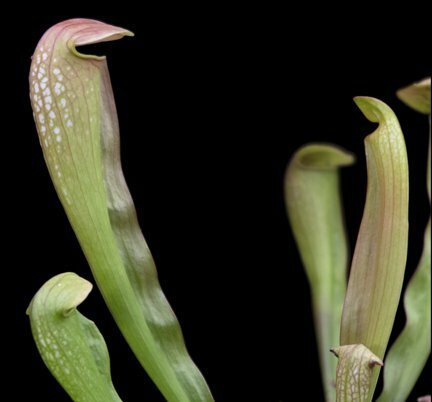 Sarracenia (American, or Temperate, Pitcher Plant): Grow using the tray method year round. Hardy outside year round in the Bay Area and can take full sun once hardened off. Pinguicula moctezumae is a Butterwort from Mexico. It looks like it has had a hardy meal. Pinguicula (Butterwort): The species that we currently carry, Pinguicula moctezumae, is a Mexican species which grows in an environment where it has warm wet summers and cool dry winters. Thanks, Anne for all the great info! We were not having a lot of success with our pitcher plants this year so Hap tested the water. In the past, EBMUD’s water was nicely neutral, but this year it has become a lot more alkaline so we’ve had to start correcting the water. 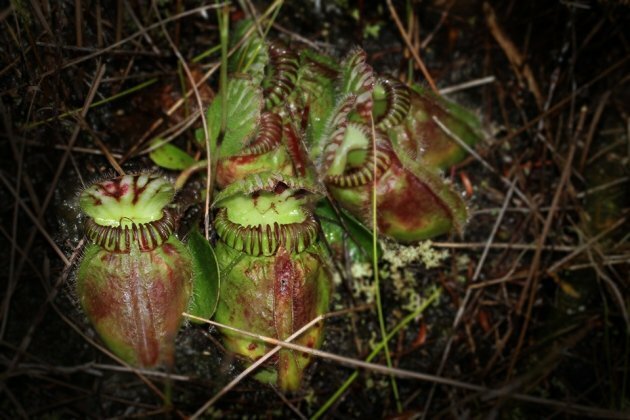 Everyone recommends distilled water for carnivorous plants, and we agree. But we’re using a teaspoon of vinegar in a gallon of regular water at the nursery since it’s cheaper. And at home we’re using our refrigerated drinking water – we put lemon slices in the water and that works too! Nepenthes alata growing a new baby pitcher, finally. It’s only about an inch right now, but it will eventually get to 12″. A remarkable relationship between a shrew and a Montane Pitcher, from the Guardian. I got a venus fly trap a while ago from you guys, but it hasn’t rained here in the bay area for a while, and I’m really tired of driving to a super market paying 50 cents per gallon of distilled/ RO water. Do you have any tips for saving water? Does adding long fibered sphagnum moss work? We find that East Bay MUD Water is PH neutral enough to use with our carnivores… as long as we add a pinch of grape pomace to the pot every now and then… Vinegar at about a teaspoon to a gallon of water is also said to work, but I have not tried it on carnivores, just acid loving orchids. And for those who were wondering where you can get this special MUD water that Hap mentions, it stands for Municipal Utility District. In other words, it comes out of our faucets, but not yours.